collections. We offer both open and targeted activities, aiming to build long-lasting relationships with visitors and to create connections with new audiences. This is a FREE drop-in space where children can bring their adults to sit and read, do simple crafts together or dress up! A lovely space to spend time with your children playing, being creative, reading together or just soaking up the moment! FREE. 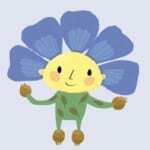 See hand-spinning and weaving of flax and hear some related fairy tales! Workshops include: making felt, prints, masks and puppets as well as painting and paper crafts. Let their imaginations run wild through fabric and costume play! 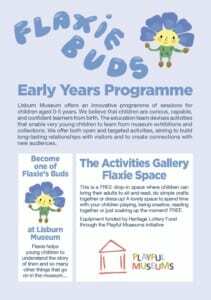 Lisburn Museum education staff will be happy to work with any group to tailor activities to suit the interests of their children. 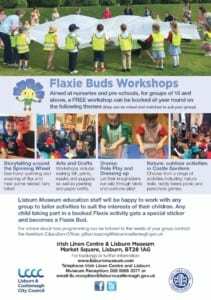 Any child taking part in a booked Flaxie activity gets a special sticker and becomes a Flaxie Bud! For advice about how programming can be tailored to the needs of your group contact the Assistant Education Officer, Gillian Topping. For bookings or further information see: www.lisburnmuseum.com, or telephone reception on 028 9266 3377 or email.